sleep-deprived Mom. She also happens to be VERY funny. 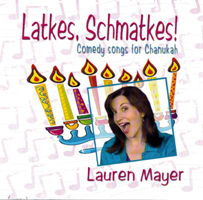 Her songs have appeared on A&E Networks, The Dr. Demento Show, and many more. 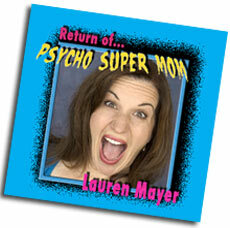 Her CD is just what the psychiatrist ordered for over-stressed Moms and the people who love them. Check out the song titles and samples below and we think you'll agree with us here at the Picklehead Mansion. Most of us have kids too, and some of us even have Moms, and we love this stuff! All of Lauren's music is now available for MP3 download! new weekly funny song on YouTube! The Jew-In-A-Gentile-World Blues * How Does Santa Know? This album is now available for MP3 Download for just 89¢ per song! Sleep, Sweet Sleep * Hormone Hell * What's Wrong With Getting By?